If your skin is suffering after the summer months (and I know I fall very firmly into that category), the Autumn/Winter 2011 trend for “Natural Complexions” probably strikes fear through your heart. We have the designers Proenza Schouler and Marc Jacobs to thank for it, who sent models down the runway with bare, flawless skin and minimal makeup. It’s a trend that looks like you’ve made no effort at all – but believe me; it takes serious groundwork to get it right. It relies on a great skincare regime and clever choices in the makeup department – so this week, I have compiled a five-step plan for the perfect complexion for the season ahead. It seems obvious, but so many of us are stuck in a rut with our cleanser – myself included… Terrified of getting a face full of spots if I stopped using it, I was hooked on my teenage cleanser well into my late twenties. It was only when I met a top skincare expert and she recommended I swapped to something better suited to my sensitive complexion that I really started to notice a difference in my skin. Think about what kind of skin type you have. Is it prone to blemishes? Is it oily in some places and dry in others (therefore combination)? Is it dry and flaky? Is it dehydrated and prematurely lined? Is it mature and starting to show the signs of ageing? Or is it sensitive and prone to redness? Once you have determined your skin type, pick a cleanser that will suit it – and you may be amazed by the transformation to your skin. Secondly, make sure that you exfoliate regularly to slough away dead skin. Not only does it keep pores unblocked (thus lowering your risk of breakouts), but it also dramatically boosts radiance. If your skin is sensitive to face scrubs, I really recommend Trilogy Gentle Facial Exfoliant, £19.35, which contains Camellia, Rosehip, and Macadamia Oils to rehydrate skin, whilst leaving it fresh, clean and glowing. Aim to exfoliate your skin twice a week. 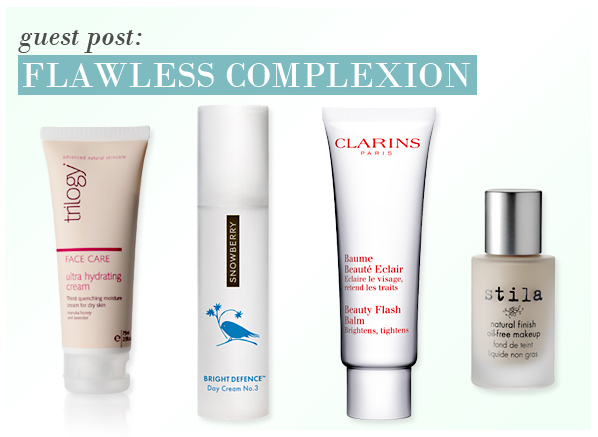 Any less and the dead skin will start to build up, giving a dull, sluggish appearance to your complexion. Any more and skin may become irritated. How much moisturiser do you apply? The experts recommend that we double the usual amount and use the cream to give our skin a pampering facial massage every morning and evening. This helps the skin to absorb everything that we apply (rather than just sitting on the surface) and gets the blood flowing for a natural radiance. Again, your choice of moisturiser needs to be closely matched to your skin type. Snowberry Bright Defence Day Cream is ideal for brightening and perfecting tone – and it comes in three different formulations to suit your complexion. Take your pick from No.1 Oily Skin, £59, No.2 Combination Skin, £59.50, or No.3 Dry Skin, £59. This stage relies on a little magic – and it comes in the form of Clarins’ cult beauty product: Beauty Flash Balm, £20.50. The award-winning cream adds radiance to the complexion in a matter of seconds. Simply smooth a thin layer to skin (after moisturiser, before makeup) and watch your cheekbones glow, your skin tone unify, and fine lines and wrinkles seem to melt away. Finally, don’t undo all the hard work by caking your complexion in a thick, unnatural foundation. You need to choose a base that will help to balance skin tone, whilst allowing your natural complexion to shine through. I’m a big fan of Stila Natural Finish Oil-Free Makeup, £25, which comes in 12 shades so you can match it perfectly to your complexion. The extremely light, easy-to-blend foundation has an oil-free formula and dries to a semi-matte finish, which keeps shine at bay, whilst promoting a natural glow. Once you start to show signs of aging, you're always on the lookout for a miracle product, to disguise all the lines and flaws. This product is pleasant to use and a good foundation primer but I did not find that it lived up to it's promises of a flawless finish. Perhaps I'm a lost cause... or just have inappropriate expectations! This entry was posted on Monday, September 26th, 2011 at 8:50 am and is filed under Guest bloggers. You can follow any responses to this entry through the RSS 2.0 feed. You can skip to the end and leave a response. Pinging is currently not allowed.